As the title says don't get spooked off by the 1.8 sigma in Musashi which isn't as good as Yamato's. The guns are plenty accurate and hit hard just like Yamato does. The accuracy is just fine even out at long ranges with the spotter. Not as good as Yamato for sure but not as bad as some reviews have claimed. No trouble putting a hurt on stuff with it. is this against bot or in random battle? also do you have some ss showing the result, I am still 300 k away from getting her, but it will not take that long. At the moment, most of my project on hold coz I had to help my friend finish off the mission. It's Co-op but that really doesn't matter. The red's may be bots but they are the same ships you see in PVP. As long as you aim properly the shells are going to hit and are going to hit hard. Harder to hit in PVP I get it but that has no bearing on my comment. Good groupings are good groupings whether it is vs bots or people and damage is damage. 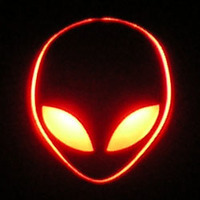 Can you provide a ss of the upgrades modules. compare her to the MO, which one had the edge over credit/damage/easy of handling ??? Gun dispersion is atrocious. 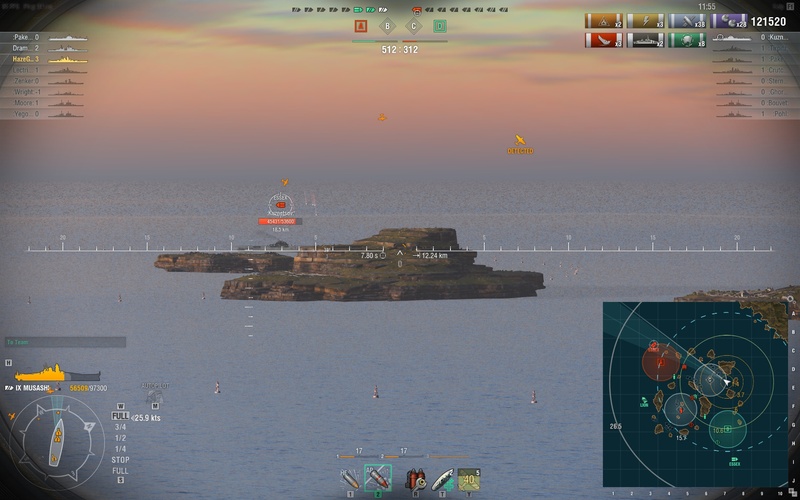 I managed to miss full salvos at broadside Missouri at 20 km range - all 9 shells would land to its sides (some in front and some behind the target from my point of view). Shells also feel slow and floaty at/above this range (I'm used to Kurfurst 406 mm shells). Remember, that's a Secondaries Build Musashi. She can do the tricks Yamato can do even at range, it's just Yamato will be a bit more reliable in doing it. Make Musashi the typically recommended build incorporating ASM1 and it gets a tad bit better. Also remember that even Yamato time to time will throw out some wonky salvos that make you go, "WTH?" Honestly, this ship has no business being in Tier IX. Absolutely. But so do about 80% of those who are T9 and 10. If we only allowed pro players or non-potatoes to go past T8, people would be in game queues for about 2 hours. As far as damage in my 10 games (Co-op) I am averaging 131K for damage with a high of 199K. Most kills is 4. For comparison and FWIW, in Yamato with 74 games (Co-op) I am averaging 115K for damage with a high of 265K. Most kills is 5. - I am used to how the guns work now. No learning curve as they are the same as Yamato's even with the lower sigma. - Everyone and their brother it seems has been out either in their Musashi or other high tier BB's in Co-op testing the ship out (playing or against). You get a lot more damage when you don't have 5+ DD's in the game which happens a LOT in T9/T10 Co-op. I have had a bigger damage potential pool with Musashi. Missouri easily has the edge in credits. That is a no brainer. Musashi earns better than a T8 Premium and about the same as a T10 w/ T10 perma camo. Musashi has the edge in damage over Missouri as the guns are bigger and do more p/ hit even though Missouri is a little more accurate. What do you mean by handling? Actual maneuverability or just overall playing the ship? If you mean maneuverability Missouri is a LOT faster (6 knots faster) but Musashi is actually a little more maneuverable with a better turn radius and rudder shift. If you mean overall it is hard to compare as they play very different. Missouri is a raider. A Calvary soldier who can move around as needed fast and attack doing good damage. Musashi is like a big old tank. It is slower and the turrets take a long time to turn so you sort of have to plan ahead and stay the course (literally so you don't have to swing the guns much). 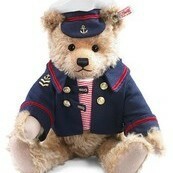 It is a long range bombardment specialist. Haven't played either enough yet to know if I will really like one more than the other? I do more damage in Musashi but make more in Missouri. From my experience, Musashi has been a really frustrating one. The first game was great, all my shots were pretty well connected with their targets. 160k dmg. Since then it's down hill. The rate it fires is great, but at the rate it misses it could mean the game. I think it's fair to say it's overpowered IF and IF you hit. Otherwise you are just an exp pínata. So far, I'm not sure if it's the emblem patch or what. 24 games 19 with CV. And got focused down so many times it is frustrating. It move so slow that when the allies runs and abandoned objective, it leaves you open to be punished. And if all your shots missed, it's just a waste. As you can tell I am extremely annoyed by it's sigma. I missed full salvo at 11km, the shell went over and under just not at the area I want them to be. But when Musashi connect those shots. It's back to port. 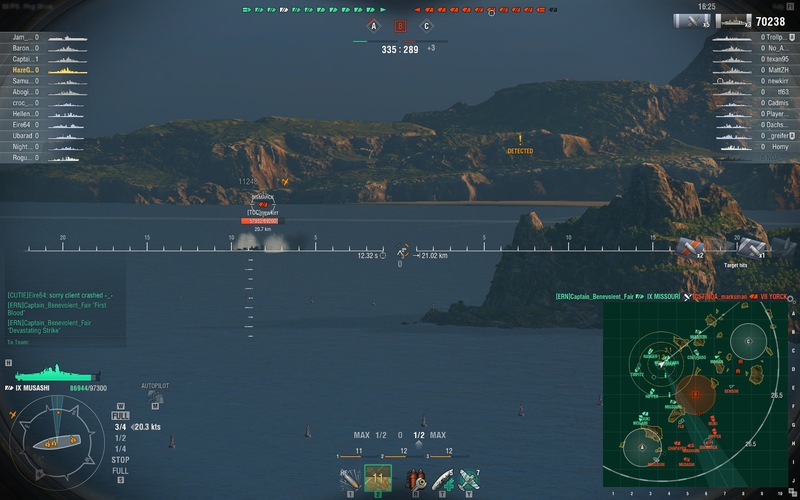 Yamato can completely whiff on a non-moving target at 10km. RNG is RNG. However on average Yamato dispersion is excellent compared to every other BB. 18" guns will occasionally get Citadels on angled ships that you would not get with any other gun. I imagine this is what is what is causing the hub bub regarding the Musashi. Again, the guns are more than fine. This time with a proper ASM1 fitted Musashi, still making hits with good results at range. Long range attack on Missouri with hits at 20km for a double-citadel strike. 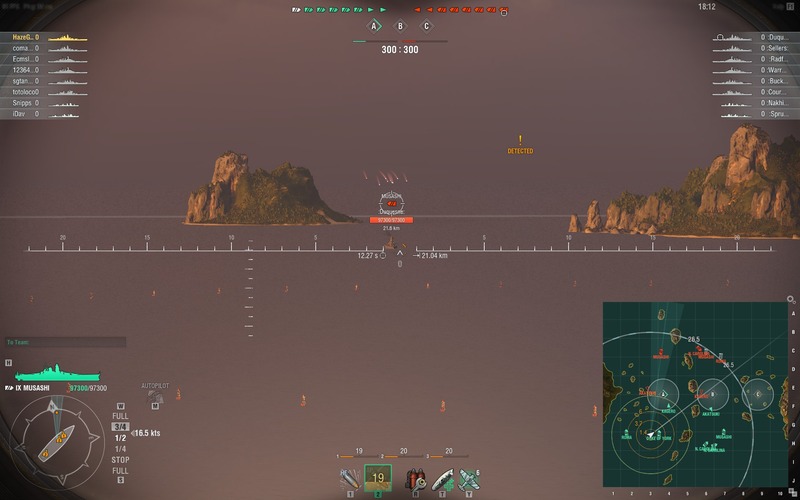 Making long range hits on a Bismarck in the same match. Again, Musashi's sigma is off compared to Yamato, but she can still make good ranged, accurate attacks that very few BBs in the game can match, much less surpass. A slightly less accurate set of Yamato 460mm guns is still better than almost all other BB main batteries out there in terms of precision and power. People talk about 1.8 sigma as though it's /BAD/. 1.8 sigma is what most battleships have, and they have that without 18.1 inch guns. 1.8 sigma is the same as Amagi's and Izumo's. I never have problem with the guns on these two ships. I think LittleWhiteMouse explained it well. For every 7 good salvos you get with Yamato, you get 6 (or maybe 5) with Musashi. However, those shells are monsters when they connnect. I never got the hang of playing Yamato until I dumped the Free XP on Musashi. Nose in, passive sniping is not my style. However, both ships can be really powerful when you position correctly and push at the right time. 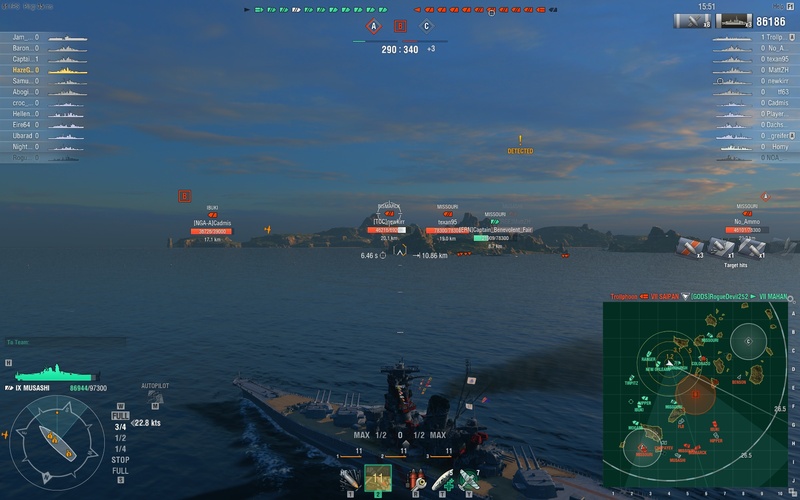 Getting 2 citadels on a Zao at 21 km with Yamato showed me what I’d been missing. Okay, I had to chime in on this here post. I hit moving enemy Yamato in Musashi starting from 24km three times in a row, multiple shots from each salvo would cause heavy damage on each of the salvoes. Second salvo and third salvo cause 1 citadel each. All of the shots where at distance greater than 20km. Musashi shells are way more accurate than German BBs, and I have grinded all the way to GK, so I know a thing or two about German gunnery. How does she do as a secondary build? The 155's are the largest caliber Secondaries in the game if memory serves. She is a Tier 9 Yamato for All intents and purposes. Range isnt the problem for Musashi's secondaries. It's reload speed. That is what drags it down tremendously. Yamato has faster firing secondaries. I had Musashi in a Secondaries Build more of a stress test of her Main Battery without the benefits of ASM1 and it's still just fine. Those guns make a mockery of Tier IX BBs, much less other ships she stomps at Tier VII on the rare chances she is Top Tier. People still say, "Musashi has no business in Tier IX" for good reasons. Player her the same way as Yamato, and if you have secure flanks and keep the fighting in one direction, she is EXTREMELY dominating. You smack around Cruisers. BBs are not safe because they simply cannot just go bow on / angle and ignore your damage because 460s don't care, 460s don't give a f--k just as they did with Yamato. When Musashi / Yamato come out of hiding and fire their guns, it's funny to watch the Iowas, Missouris, etc. scatter like roaches. Musashi will get pulled. Eventually. Missouri was supposed to be in the store for good but it's getting yanked. The same will happen with Musashi, IMO, but since she just came out, it'll be a long time before that happens. The wonderful thing with Japanese battleships in general is that they have exceptionally good base dispersion, so high sigma isn't as great an impacter on them as they are on other ships. To put that into perspective, Yamato and Musashi have the same max dispersion at 26.6km as Bismarck does at 19.3. That's a REALLY significant difference. It's why Kii with a 1.7 sigma, and Fuso with a 1.5 sigma still put out some very impressive damage numbers. It makes playing IJN BBs as a whole very satisfying as good aim is rewarded. I have not been able to get past 80k damage in 5 games so far. The good news is if the grouping is tight, being able to one shot CA's is fun. The bad news is not being to do it reliably. I am not really have a problem with her guns hitting things. She seems to hit with a fair amount of her shells per salvo. But, I am have issues with the shells over penetraiting everything constantly. Its almost pointless shooting Cruisers as the shells sail right through them. This makes it hard to carry in her since the targets you should prioritize are easily over pen'd. One of the great joys of Musashi being top tier is meeting Nelson. That is a fight that Nelson will badly lose as her Mega Repair Party is useless against the kind of AP punishment Musashi will lay in. 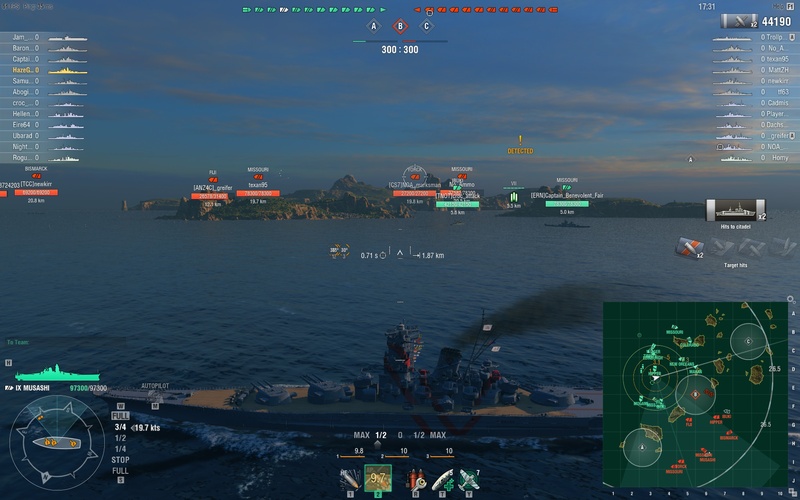 I just played my FIRST match in the Musashi, and getting a citadel in a BOW ON Yamato? Oh man... PRICELESS! It may not be the beauty the Missouri is, but I think I am going to love this boat. 460s are the only shells you have to worry about in Yamato / Musashi that can punch right through the bow. OTOH, she can bow citadel Montana easily and not worry about the same in return.